This delicious and nutritious smoothie recipe was concocted for all the coffee and smoothie lovers out there. Health experts can’t seem to agree on whether coffee is healthy or not. I believe in bio-individuality, meaning for some people coffee is great, while for others it’s not so good. There’s a reason many indigenous cultures across the globe have sought out caffeine bearing plants. Caffeine, like alcohol, has been shown to extend lifespan, but only when consumed in moderation. 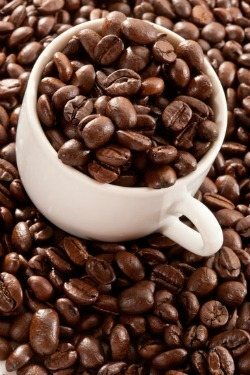 Here are a few of the health benefits coffee has to offer. I personally have never been much of a coffee drinker, but I do like to use it in my smoothies every once in a while. If you find you really like coffee smoothies, feel free to substitute it in for whatever liquid other recipes call for. You can take this smoothie in one of two directions. For more of a drink or latte, don’t add a thickener such as chia seeds, ice cubes, or a banana. If you want a creamy smoothie, use one of the aforementioned thickening ingredients. Enjoy! I’d love to know if you try this coffee smoothie – please do tell in the comments below. Happy Blending! YUM! Im drinking this as im typing this and im in love! So happy I found your site, thank you so much for all the great info and recipes! I used vanilla Sun warrior protein blend and added a banana and a little extra coffee. Perfect! My new addiction:) Thanks! I fall in love with some of my smoothies too :) Thanks for the kind words about my site and recipes. Vanilla Sun Warrior and a banana, nice add-ons! Just a quick tip for coffee smoothies, I make coffee ” ice cubes” from my coffee instead of chucking it. The ice cubes are perfect for smoothies. Just wanted to share. Now I have to make this one & get a bit of a late start to my day. Thanks again! I’m glad you found my site too, especially considering the great tip you just left :) That’s a good idea to prevent wasting, and to incorporate coffee more easily into your smoothies. Made this today and it a winner. We bought some amaretto coffee beans and I use 1 cup coffee and 1 cup almond milk so we both had the drink. I added 1/2 banana, 2 tbs chia seeds and 3 tbs. of coconut flakes but left out the cashews + honey. Drank it on the warm side but I’m sure it’s going to a great cold drink. I like the lower carbs. Thanks much Ryan. Ryan, as you see above, we loved the coffee smoothie. Just thinking, if we wanted some vitamin C and other nutrients, is there a better choice than blueberries? Also, the first time I did not use cashews but now add 3 tbs. almonds. For another variation, would greens work, spinach etc? For vitamin C, you could use a powder such as camu camu or acerola cherry. Both are a little more obscure, but available if you search. My favorite online retailer, Mountain Rose Herbs, carries them. Almonds are just as good as cashews. I don’t like greens in smoothies like this or elixirs, but you’re free to add them. Delicious. Tastes like coffee ice cream! Added banana and ice cubes. Yum! Banana and ice cubes – nice, Gina!